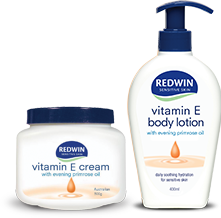 Nourish and soften your skin with Redwin Moisturiser with Vitamin E and Evening Primrose Oil. Rich in natural moisturisers and with a protective barrier, Vitamin E blended with Evening Primrose Oil helps to lock in moisture deep within your skin so it continuously hydrates your skin all day. Helping to soften and smooth dry skin, reduce blemishes and increase skin elasticity. For best results apply generously all over your skin and then once absorbed reapply. Use everyday after showering with Redwin Sorbolene Body Wash and after sun exposure.